Pteramander is a plant for the blue-red instants and sorceries archtype that has become a staple in casual settings, a category we’ve come to expect in basically every set nowadays. It does, however, have a couple of things that set it apart from other such cards. We rarely get one that compares so clearly to Delver of Secrets: the same mana cost, and the same threat of becoming much more threatening than its base stats as your deck does its thing. You can even use the adapt ability as a combat trick, meaning that an opponent resolving a dragon doesn’t necessarily put you on the back foot. Once you get three or so spells in your graveyard, your opponent will never be sure if you’re holding up a Frilled Mystic or getting ready to adapt the Pteramander at the end of their turn, and those mind games alone make this guy worth considering. I doubt he would truly replace Delver of Secrets in the more competitive decks, but he offers a lot of interesting gameplay (and, once again, a truly cool creature type line). Talk about excitement at uncommon. Pteramander is interesting for what it can become: a two mana 5/5 with flying. 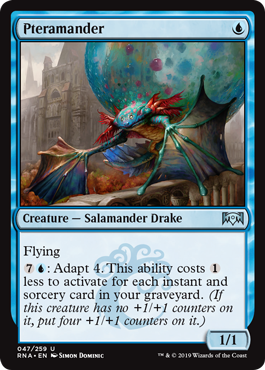 As far as rates of return go, that’s pretty formidable…and the Pteramander has the upshot of being in one of the heaviest colors for instants and sorceries, blue. It’s fairer than some of the delve cards that warped formats, but it’s still efficient when it comes out to play; in an Izzet-style spellslinger deck built for maximizing the output of Pteramander, I could see it adapting as early as turn 3! That would basically ask for a god hand and an immaculate sequence, but the little winged perversion still can serve as late-game insurance for any deck with blue and a bunch of instants and sorceries, ironically playing better with Izzet than in its own guild.